This afternoon, Tony Clement, the President of the Treasury Board and the Minister responsible for Open Government in Canada held a TweetChat as part of his consultation on Open Government. I captured what to me was the main line of discussion via Storify. Enjoy. Springtime for Government 2.0 in Ottawa? Now that Prime Minister Stephen Harper has been re-elected with a majority government, Canadians can begin to expect him to pursue some longer term objectives. Canadians rightly expect fairness and accountability in the full range of government institutions that serve them. … Our Government will also support the efforts of the Public Service to modernize the way it works so that it can continue to provide the highest standard of service to Canadians. …. Our Government will also ensure that citizens, the private sector and other partners have improved access to the workings of government through open data, open information and open dialogue. Open Data, which is about offering Government data in a more useful format to enable citizens, the private sector and non-government organizations to leverage it in innovative and value-added ways. 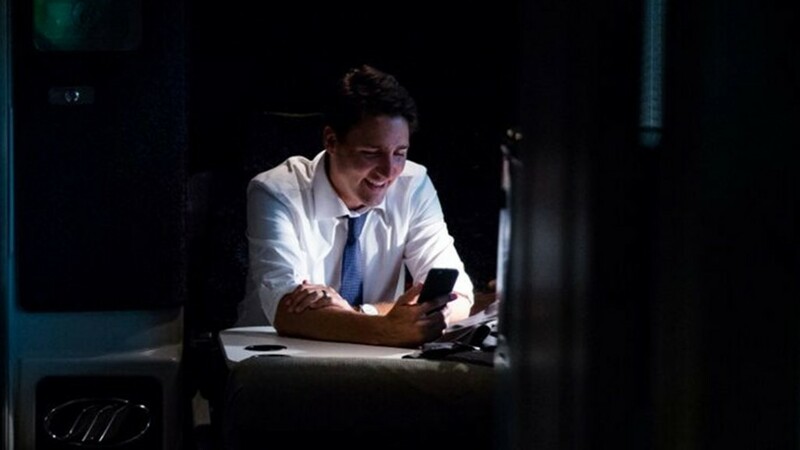 Open Information, which is about proactively releasing information, including on government activities, to Canadians on an ongoing basis. By proactively making government information available it will be easier to find and more accessible for Canadians. Open.gc.ca hasn’t been updated since it’s launch. 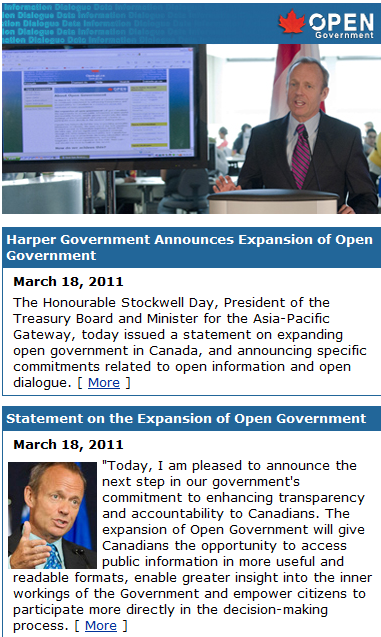 The front page still features the March 18 initial release and statement from then-Minister Stockwell Day. However, in light of the Throne Speech reference and New Treasury Board President Tony Clement‘s recent interview endorsing the Open Data initiative, we should start to see updates and news of further initiatives. I’m going to follow this closely and write about it more often. I hope that you’ll follow along with me and join the discussion. Since Bryan Person organized the first Social Media Breakfast in Boston last year, the concept has caught on and been introduced in cities across the United States. Now, the Social Media Breakfast concept has been brought to Ottawa, Canada’s capital, by Rob Lane, Ryan Anderson and Simon Chen. The first Social Media Breakfast in Ottawa was a great success, drawing a standing room only crowd. Mark Blevis , Melany Gallant , Stacey , and Simon Chen covered it in posts and pictures . SMB Ottawa co-founder Simon Chen sat down with me to talk about the Social Media Breakfasts – what they are, the upcoming event with Rob Lane and who attends these events. By the way, I thought it was interesting that Simon got the idea to bring the Social Media Breakfast concept to Ottawa while he was following the Twitter stream discussing the Boston Social Media Breakfasts. Watch the complete videoof my discussion with Simon Chen below. Competitive pitches for new business. They’re the bane of any agency or firm that must participate. And they’re also an unavoidable fact of life. Public relations practitioners get up every day looking forward to doing great work for their clients. But in order to get the opportunity to do this, we first must win the confidence of those clients. This is best done by developing a reputation for doing outstanding work and the network of people for whom we have done this who will then call us directly or provide us with referrals. In this situation, the battle is nearly won by the time that you hear the words, "I have this challenge that I’d like your advice on…"
However, not all relationships originate in this way. Many potential clients, especially large corporations and governments, feel they need to conduct formal competitions for their business. The way these competitions are run is highly idiosyncratic. Short list. Long list. With creative presentations. Without creative presentations. Proposal only. Proposal plus presentation. Budget revealed in advance? Maybe. Maybe not. A blind competition in which you do not know the identities of the competitors? More often than should be the case. And costly. Boy, does it cost a lot to win a competition. A determined firm will pull in a team to research the client, the client’s industry and the client’s competitors. Brainstorm(s) will be held to develop ideas. A formal proposal will be prepared. Artwork and mock ups will be created for visual, physical and Web elements of the program. Cost quotes will be obtained and a budget prepared. All of this will be pulled together into a bid package. Then a PowerPoint will be prepared to support the team presentation, which will itself be rehearsed. Finally the team will get a chance to present their ideas to the client. All in all, thousands and probably tens of thousands of dollars worth of time and direct expenses are invested in a competitive bid. So, it’s only natural that communications firms pine for a simple bid process that is fair and transparent. Now, a new firm, Agency Link , wants to get into the middle of the selection process with a promise to help clients find the PR partners who best meet their needs. Agency Link offers a range of services, including audits and evaluations of existing client-supplier relationships, assessments of RFPs, assistance with search and selection of PR firms, and contract negotiations. Agency Link will work for the clients, not the PR firms. And they have published a Code of Conduct to reassure both clients and PR firms that they will conduct themselves in a fair and transparent fashion. This is a new concept in Canada. And most PR firm heads I know are quietly supportive of Agency Link, hoping that it will deliver on the promised of a more effective selection process for those clients who use its services. Agency Link is the brainchild of two co-founders, Stan Didzbalis and Sheila Corriveau . Both Stan and Sheila have extensive experience as PR firm principals and on the client side. Stan was the founder of BenchMark Communications, which he grew to over 50 consultants before he sold it to Omnicom. Before establishing his agency, he worked in communications at two bluechip corporations, IBM and Inco. Sheila is a former CEO of Porter Novelli in Canada. Her corporate experience includes leadership roles in several communications functions at The Dynacare Health Group. I caught up with Stan Didzbalis this week in Toronto. He took a few minutes to talk to me about what Agency Link is up to. Stan told me that there are two sides to Agency Link’s business. "One is to help clients find the right agency fit – whether it be a public relations agency, a digital marketing agency, an investor relations firm. … The second part of our business is a consulting practice. We consult with clients to help them optimize their agency relationships and get the best that they can out of their agencies." The benefits to agencies? According to Stan, "We hope to take some of the inconsistencies out of the search process. We hope to eliminate cattle calls. We really want our clients to minimize the agency churn. The best way we can do that it to educate the clients on how best to utilize an agency resource." Here. Here. I’ve gotta wish Stan and Sheila total success in achieving these objectives. You can watch the video of my interview with Stan Didzbalis here.